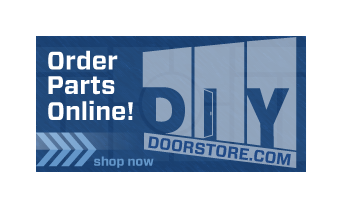 The B-Series door is a steel stiffened door incorporating all the design features of the L-Series door. The stiffeners are welded to the face sheets 4″(102mm) on center vertically and are located 6″ (152mm) on center horizontally. The void areas between the stiffeners are filled with fiberglass. High gloss paints should be avoided especially on B-Series doors. The welds used to hold the stiffeners in position will be visible when high gloss paints are used. Steelcraft decorative doors feature deeply embossed panels on both sides. 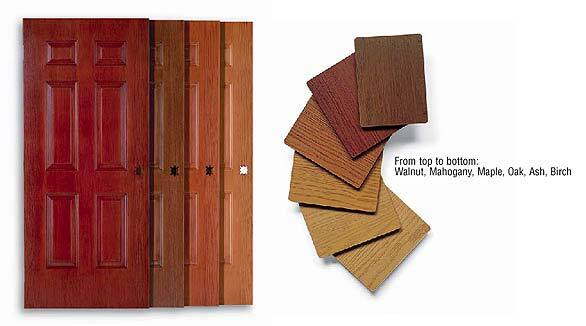 Six panel and eight panel designs are patterned after traditional high quality, wood panel doors, but add the durability, fire protection and long-lasting operation of steel doors. The polystyrene core with honeycomb around the perimeter gives Steelcraft decorative doors added strength and makes the doors energy efficient. 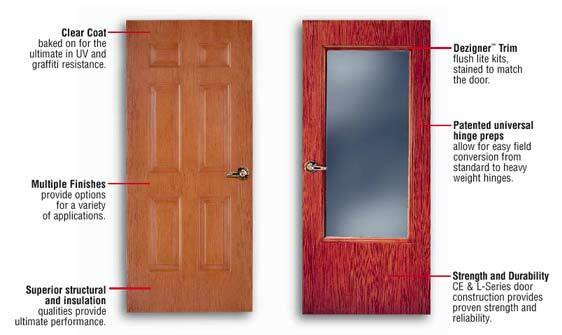 Decorative doors are manufactured in either 20, 18 or 16 gage hot dipped A40 galvannealed steel, conforming to ASTM A653 specifications. Steelcraft’s GrainTech™ Series of stainable steel doors provide the beauty of wood with the features and benefits of steel. Our exclusive engraining and staining process simulates a wide variety of wood finishes, from Ash to Walnut, including custom finish matching. Unlike veneered or solid wood doors, GrainTech™ is fully warranted for use on exterior openings, is less susceptible to damage, and will never warp, crack, peel or bow. 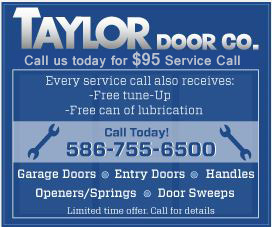 Plus it is available in CE-Series panel doors, L Series full flush doors, and T Series temperature rise doors. The GrainTech™ Series is available with a full range of positive pressure fire ratings, from 20 minutes to 3 hours. CE-Series embossed panel doors feature deeply embossed panels that create the appearance of hand carved doors. They are available in a wide range of specifiable options including sizes, glass lite designs and hardware preps and are designed for interior or exterior applications. L-Series doors feature honeycomb core and are designed for installation in all interior and exterior applications. 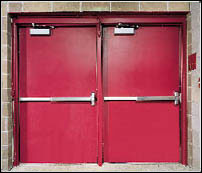 The continuously bonded cores and full height mechanically locked edge seams provide attractive, flat and very durable doors for commercial construction. T-Series temperature rise full flush doors meet the broadest fire rating requirements and provide a 250 degree Temperature Rise Rating. Custom finish options available to accurately match existing wood treatments.